Whatever mental or physical associations you have made in the past between effort, time and progress, will be challenged and re-written on the WCT. Time will be spent circumventing mud holes and the energy you will expend climbing ladders only gets you ahead by a few feet on your 75km quest. On the beach portions of the trail, slab will speed you up while soft sand and boulders will definitely slow you down. With that said, my body never felt more alive, fit & rejuvenated than it did by the end of this trip. The number of hikers joining the trail on a given day is limited to 15 from either end. A sense of community with your cohort develops by day 2, if not at the first campsite. 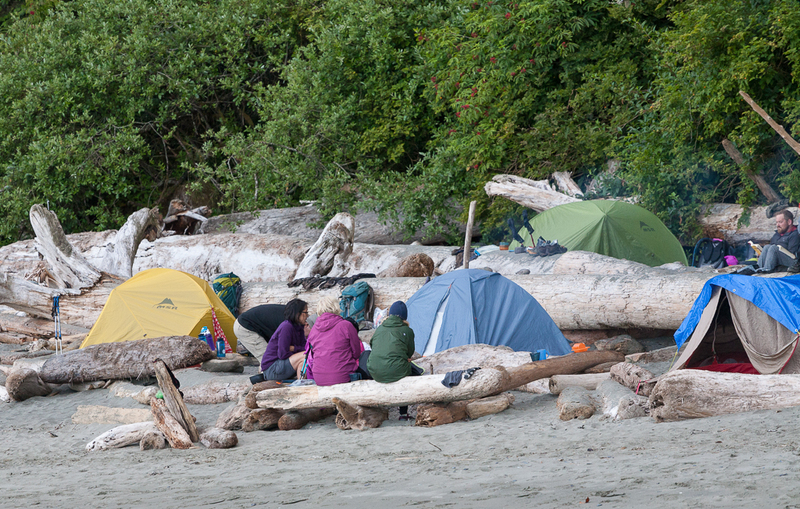 While individual parties might set out from one campsite and arrive at the next at different times, meal times and the after-dinner campfire were always an occasion to catch up with others. We would quickly get the intel (location of bear bins, outhouses, best spots for a tent, or firewood…) at a new campsite by having a quick chat with a member of our cohort or northbound hikers. Our cohort was comprised of Team Tom (Tom, Karen, Sheila & Debra), Jack & Nate, Paul & Emma, Nadav, and the 4 Dudes, and we had a great time sharing our experiences on the trail together. We also hung out with some northbound hikers as well (Markita & TJ, and Byron). By day 3, bonds are starting to form, and a sense of security came from the trust that we all had each other’s back. Whether it be food, a piece of equipment, medical supplies, or simply needing a hand, we wanted for nothing during our trip. Let’s face it, with only 3 far flung access points, and limited (i.e., do not count on it) cell access, each passing day will immerse you that much deeper into a world that couldn’t be further away from your office desk. Even as I approached the other end of the trail, I still felt like I was getting further from civilization – or was it simply a matter of getting that much better at loosening myself from its grip? Soon the smell of the cedar campfire smoke will impregnate your clothing, and even your paper documents. The sound of the waves, whether it be lapping, slapping or crashing is never too far away. The rugged beauty of the shoreline, and delicate presence of the rainforest, alternate throughout the trip, ensuring that your senses are processing a new vista at every turn. You will come to appreciate and become an expert in the subtle differences in all forms of terrain. Different types of sand will be easier to traverse, while you will quickly learn the different qualities of mud, and which conditions can be trusted in terms of where to place your next step. 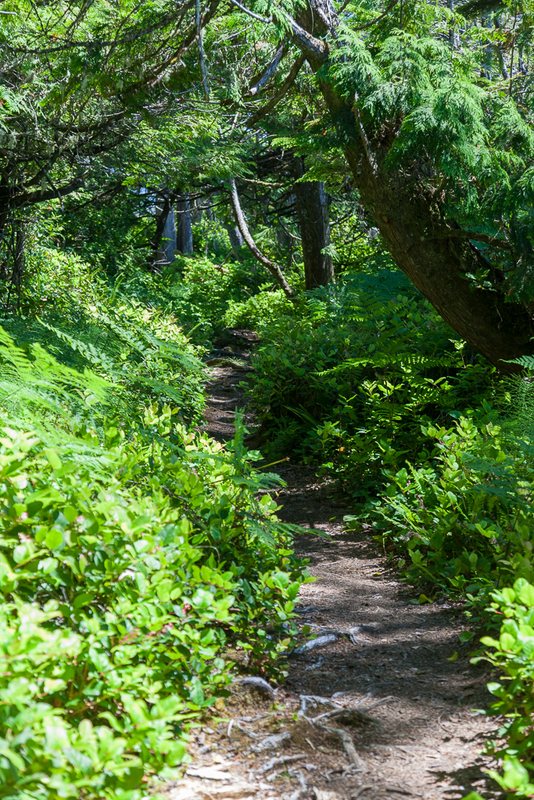 Take the time to explore side trails. They are short in length (ranging from mere seconds to 3 minutes to cover), and will give you access to beautiful vistas or wildlife viewing. You won’t find any signage (e.g., the standard binoculars pictogram identifying lookout points), and so you will need to rely on your ability to stay focussed while hiking, and your instincts as an explorer. 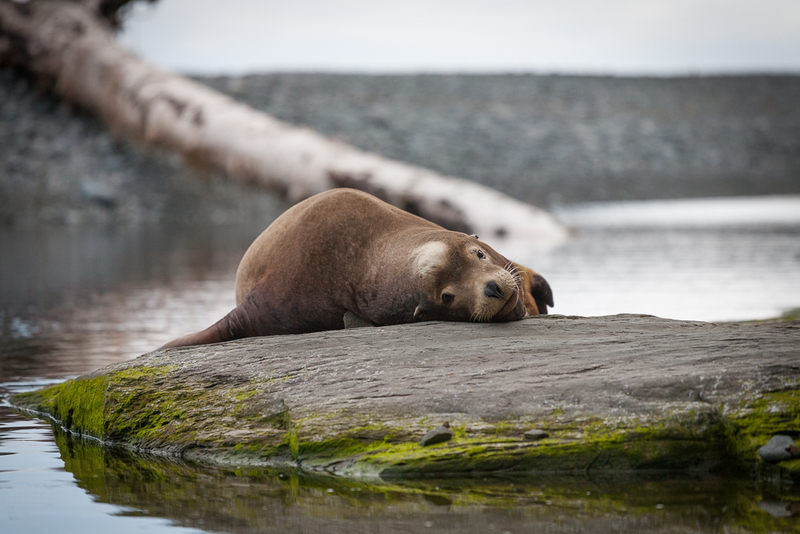 Pay close attention to locations designated as sea lion haul out rocks on the trail map. These creatures were waiting for us at the 9 and 44km points on the trail. We were tired by the time we neared the 9km marker, and if it was not for our questions of a northbound group of hikers about the spur trail where we found them taking a break, we would have likely missed the opportunity to see the sea lions and bald eagles (big bonus) just a few minutes’ walk away. We took the time to clamber over some tall rocks to get a closer look at the sea lions at km 44 where we also found some tide pools containing beautiful sea creatures (another bonus). During this trip, we also had excellent opportunities to see gray whales, sea otters, and a pod of orcas. A camp mascot (sea lion) was very accessible at Camper Creek. Approaching it with caution, and sitting to allow it to adjust to my presence at different intervals, allowed me to capture the close up shots that you see here. If you are paying attention, you will also spot some of the supporting actors on the inland trail – slugs. With some being the size of Cuban cigars, they are adorned with different patterns and colours. Much has been written about the mud and the ladders. We came to embrace both, and accepted them as an integral part of the experience. This is also probably an appropriate point for a confession: we experienced only a few hours of light rain on our trip, and that was limited to the final day at that. Had we been exposed to a significant amount of rain, the ensuing rivers of mud, and ultra slick tree root, bridge and boardwalk surfaces may have diminished the romanticized version of our experience that I am painting here. In fact, at one point a few weeks before our trip, my brother threatened to cancel the WCT in favour of Hawaii if the forecast called for too much rain! The inland portions of the WCT are almost entirely in rainforest habitat. We encountered long stretches of bogs between Nitinat Narrows and Cribs Creek whose passage was facilitated by boardwalks that were in perfect condition. The trail hugs the sea cliffs at times, and will provide you with an experience not too different from ledges in an alpine setting. While the trail is often generously wide, compacted and clear, you will encounter a good number of tree roots that will present two types of hazards: many will be coated in grease (i.e., wet mud), while others will present an entanglement hazard where falls or twisted ankles are a possibility if you are not careful. For as much as people are individuals, the ladders come in different lengths and pitches. Some will be as short as 6’ – 8’, while others will be a couple of stories tall in one stretch. Their pitch could be as low as 30° which will almost feel like you are crossing a floor on your hands and feet, or as steep as 90°, where you become ultra-aware of what would happen if you made a misstep. Most are a comfortable 50° – 60°, allowing you to use your arms and legs efficiently, and avoiding thinking about what would happen if you fell backward. And yes, ladder rungs will have the mud from prior hikers on them. Rub your hands together quickly when getting off them and all will be good (as in: “look mom, they’re clean!”). These will range from being made of freshly cut cedar planks that are securely fastened to sturdy rails to older ones that are slanted, have missing planks, are only sometimes a better option than walking through the mud adjacent to them. The oldest ones will have moss growing along the edges, and are in the process of decaying and returning to nature. You will also encounter many bridges on the trail. Some have single hand rails, others two. 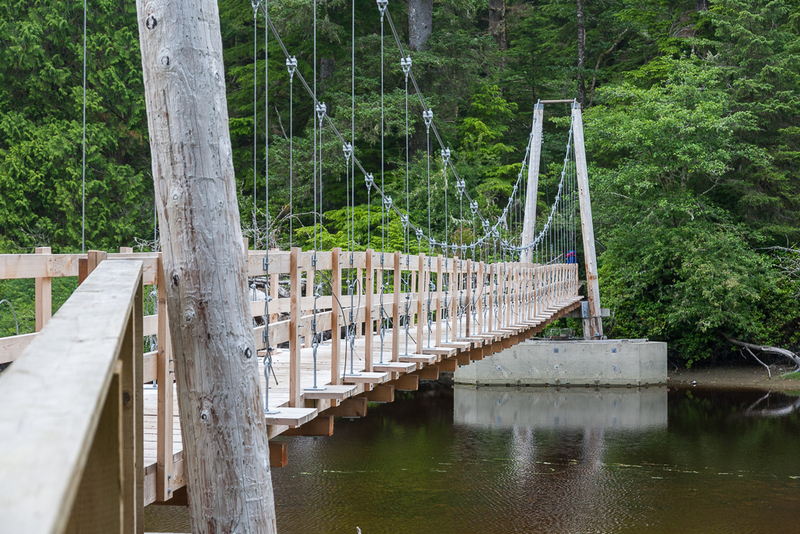 Most will be rigid, but the narrow suspension bridge at Logan Creek will provide thrills like no other! The log bridges can be some of the most challenging. The tops of the logs have been chiseled flat, and have hash marks for traction, but most have a coating of mud on them, and few are not at an incline of some kind or another. By contrast with the inland segments, beach segments offer an opportunity to feel the expanse of long, wide beaches, big skies, and an even bigger ocean to one side. 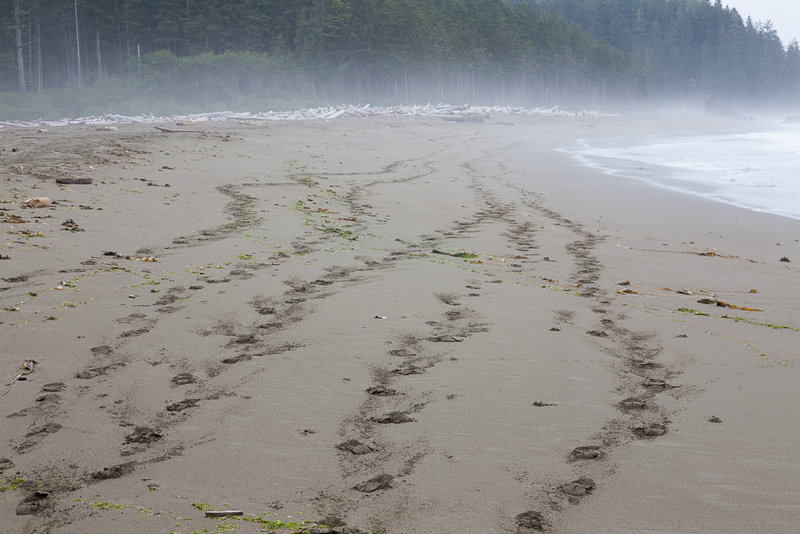 While the time needed to complete segments of the inland trail depends on mud holes, roots and bridges, the time to complete segments of the beach routes depends entirely on the quality of the sand/pebbles underfoot. Another key distinction is the absence of kilometer markers on the beach – we came to appreciate these as important sources of feedback on our progress. Instead, the beach route forces you to hone and apply your map reading skills, and the use of points or bends in the beach to relate your position to the map. When the tide was retreating, we sometimes benefitted from the hard wet surface of the sand to move effortlessly along. Sections of beach will consist of gravel or pebbles. Here we chose to find the high spots created by the tide to save energy. My brother taught me that stepping on dry moss patches also reduced the amount of sinking you might do. Slabs of rock exposed at low tide also presented great opportunities to explore tide pools. The guilt we felt about crunching so many miniature mollusks under foot subsided after a few hours – there were “billions” of them! Striations in the rock are tempting to follow: they form a straight line of sorts, and tend to keep puddles of water to the sides. They also tend to take you further and further away from the beach, resulting in a route that looked more like we were zigzagging than following the contour of the beach. Reading and using the tide table is probably the one aspect of the trip that I can describe with the least precision. The time between peak high and low tides is about 6 hours. When doing this trip for the first time, it’s almost impossible to estimate how long it will take you to get to your next campsite – remember, this is not your typical 3km/hour hike. And so you will want to err on the side of caution for those stretches where the window to pass is smallest if you want to avoid having to turn back, or possibly get wet. There were really only two stretches where it mattered most for us – the final leg to Cribs Creek, and rounding Owen Point, and we managed through both of them (the first with little time to spare, the second very nicely). 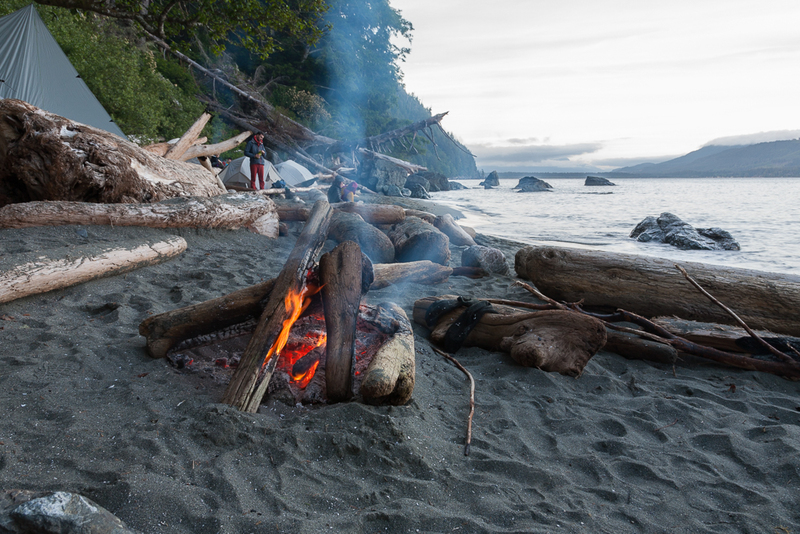 Camping will always be on a beach and on surfaces that range from fine sand to pebbly. The dew from the night before ensured that my feet were properly coated with fine sand the morning we were at Cribs Creek, and I think it took 20 minutes before I had enough of it removed before I could put my socks on for the day’s hike. Space in bear bins was available everywhere except at Tsusiat Falls where a winter storm had carried one of the bear bins out to sea. We improvised and hung our food bags from the rope with decorative buoys that welcomed hikers to Tsusiat Falls. On some days, you will be setting up your tent pretty much anywhere you want, and on others, you will be pretty close to your neighbours. The number and spacing of campgrounds are such that there are more options to break up the trip in different ways on the northern half of the trail than the southern half. This results in greater concentrations of north and southbound hikers sleeping at exactly the same campgrounds (Camper Creek and Thrasher Cove). It can get cozy, but it wasn’t ridiculous. Be prepared for longer lines at the outhouses though! Click here to get back to the main article.